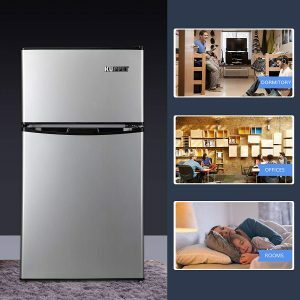 Kuppet 2-Door Compact Refrigerator is a stainless steel unit with a 3.2 cubic feet capacity, that is suitable for small kitchens, garages, basements, dorm rooms, game rooms and offices. It is a fridge and freezer with reversible two doors- to be opened from the left or the right, whichever is convenient for you. You may purchase it in either black or silver colors with the same price tag on the day of this product review. In the fridge section you can put your beverages, veggies, fruits, snacks, eggs or whatever you want and the frozen yogurt, ice cream, frozen snacks in the freezer. 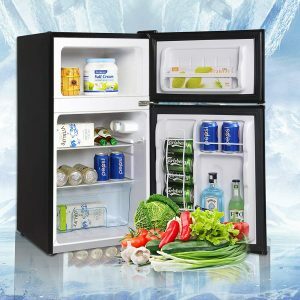 If you live by yourself this may be sufficient for your daily fridge and freezer needs. The modern and efficient R600a gas compressor makes this mini fridge/freezer work well, but silently without doing too many cycles. The noise level is specified as 38 decibels, which is pretty low for a fridge. You’ll only hear a light humming noise from the compressor during its cycles. Your items will be kept at the optimal temperature with the adjustable thermostat. You can expect many years of reliable operation and powerful and quiet performance from it for many years to come. The sleek and modern looking mini Kuppet Fridge has a 3.2 cubic feet capacity and space saving with the measurements of 17.95 W x 33.5 H x 20.67 D inches. Despite being small on the outside it offers good amount of storage space. It will not disturb your sleep or conversation when it is doing the cycles at an average of 38 decibels of noise. Your drinks and snacks will stay cool and fresh with the precise temperature control by the adjustable thermostat and the efficient compressor. The constant temperature environment will be kept consistently. And the freezer is good enough to keep frozen meat or veggies properly frozen. Having two doors rather than one unlike on some mini fridges is definitely more convenient and the freezer compartments works better. There is a can dispenser and shelves on both the fridge and freezer doors will help keep your cans and bottles organized for our easy access. It comes with two adjustable tempered glass shelves that don’t break easily and that can be removed for cleaning or for when you want to put larger items in. With 115 Volts and 60 Hz of frequency it is suitable for use in North America- US and Canada. It has a sturdy galvanized iron hinge that is designed to withstand 100k switching and is very safe to use. There is a LED light inside that turns on when you open the door and you can view your items better in the dark. Overall this is a very good fridge for a reasonable price tag and is worth having a look at.